A Wedding In Three Acts. J6, AQW's Lead Artist, has worked on just about every game we have ever made or currently have in production. He's got his own faction of rabid followers, his own t-shirt on HeroMart and has drawn many of the items and almost ALL of the maps that you walk around during every new release. He is an amazingly talented artist and craftsman who has also made real life sculptures of Artix, Galanoth's Dragonslayer Helm and his own J6 Helm. He is capable, versatile and best of all very, very fast. This dude is a machine who has never failed to meet or best any task that we've thrown at him no matter how busy he is. J6 lives and works from Canada so we don't get to see him as often as we'd like but when he does visit, Cinazool always comes with him. She is a kind, bubbly, fun, friendly and stunningly beautiful woman and after years of dating, they have finally decided to tie the knot and you're invited! 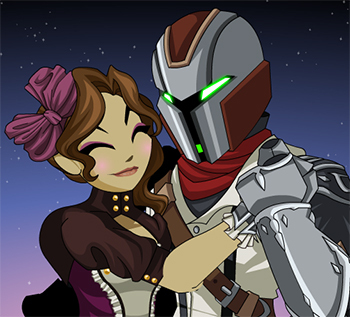 Artix was actually able to fly up to the great white north to attend the real wedding earlier this month, but for those of us who couldn't make it we have crafted this special in-game event for you. J6 honored me by asking me to write the event and keep all details about it from him. He wanted to be surprised. I was so stressed about making it funny that I got writers block and went through four complete re-writes. Everyone on the AQW team chipped in on this one and I even managed to trick J6 into doing the art for Captain Stubbing and the Love Goat map. 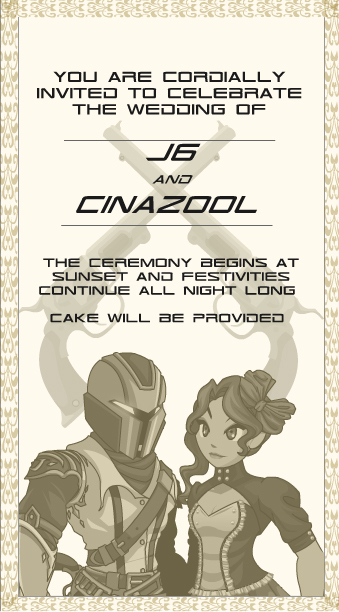 If you complete the event, you will be awarded the J6 Wedding Badge in your Book of Lore (not a character page badge) and you will also unlock all of the Member, Non-Member and AC items in J6's Wedding Shop. You will also find a lot of new drops on the various goats found in the release and on Filthy McGee. 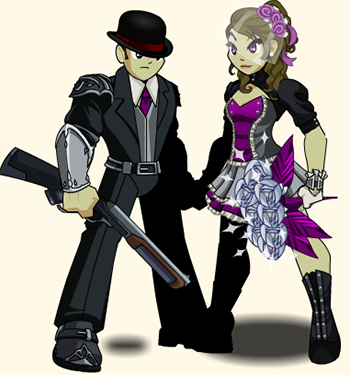 As usual there are the stock wedding items like the Bounty Hunter's Berry Mug, the Silver Eternal Flame, Cinazool's Wedding Bouquet and some others but we also have some brand new armors, helms, back items, weapons and pets in this special event. Congrats, J6 and Cinazool. May you have the best of all possible lives together. Four NEW Rare Houses in J6's House Shop! Click the "Rare House Shop" button in Battleon to check out J6's four NEW rare houses! These aren't just ANY new houses, either. They have a secret, owner-only entrance, so that no one can enter unless YOU are home! If you want your friends to gain entrance, you'll need to go to your /house and then they will need to /goto YOU! Guild Renaming is LIVE and FREE this weekend! Check your Guild menu to see how to re-name it! This weekend only, Guild re-naming is FREE! On Monday it will begin costing AdventureCoins. Be warned, if your client is cached, your name change may not appear immediately. Vindicator of They Leaves Oct 12th! 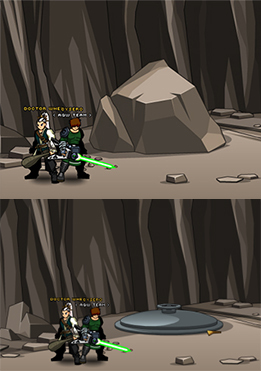 It's been almost one year since we did our special They Might Be Giants AQW Birthday event and as we mentioned when we released it... we only have the rights to use this stuff in AQW for a year. Our contract with TMBG expires on October 12th, so on that day the event will be locked forever. No more rep farming quests, no more special songs that they wrote and performed just for AQW and no more Vindicator of They Class. Time is growing short. If you haven't had the chance to earn the Vindicator class and items, remember that you still have a few weeks to buy it from Itzachi in Battleon.